Spike Lee's most ambitious joint is a biopic of one of America's most controversial black leaders, El-Hajj Malik El-Shabazz aka Malcolm X. Born Malcolm Little, the son of a bold preacher of black rights that was murdered, he grew up a delinquent and got into petty crime for which he was given a very non-petty sentence. In prison he meets Baines, a born again Muslim that becomes his mentor and introduces him to the religious leader Elijah Muhammed. Little buys wholly into the concept of achieving black emancipation by the embrace of Islam, and after he is released from prison, becomes by his natural charisma and zeal, a persuasive and provocative argument for the formation of a Nation of Islam under Elijah Muhammed. The guiding principle for this movement as I understand from the film was that Africa was the first civilization and received the word of God while Caucasian races were still savages, and therefore Africans in America must eventually return to their roots in Africa from where their ancestors were forcibly carried off by Whites as slaves. Unlike Martin Luther who followed Gandhian principles and crusaded for integration of blacks into mainstream America, the Nation of Islam demanded total segregation of black and white societies and complete power for black leaders over their communities. Macolm, with his natural charisma and zeal becomes for more than a decade the popular and powerful face of the movement. Eventually, strong differences of opinion with Elijah Muhammed and his elite council of ministers, and a late pilgrimage to Mecca, lead to Malcolm breaking off and starting his own movement, in which he retracted or rephrased several of the statements he made during his tenure with the Nation of Islam. Shortly after, Malcolm is assassinated by Nation of Islam members, allegedly on the orders of its founder. There are many strong points to Spike Lee's film, the strongest undoubtedly being the casting of Denzel Washington in the titular part. Apart from strong acting chops, Denzel bears a striking resemblance to the historical figure, and exudes the same charisma in the scenes where he is preaching to the people. This is a lifetime role for him, which he grabs with the strongest relish. The supporting cast is great in most part, and I especially liked Angela Bassett as his wife Betty. 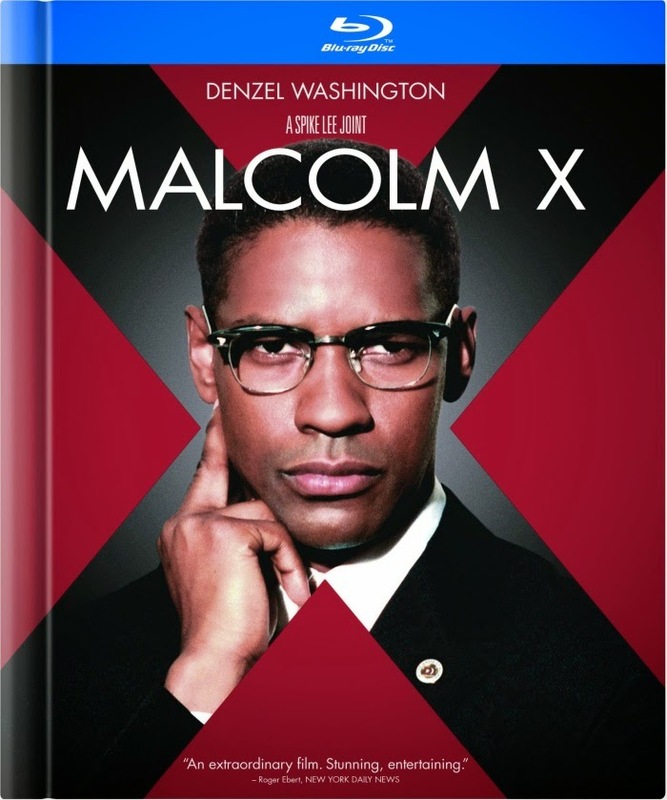 Towards the end you also have a cameo from Nelson Mandela as a schoolteacher talking about Malcolm X. The screenplay and editing are also quite strong, making the 200 min running time go quite briskly. If there is any flaw in the film as I perceive it, it is that it remains a piece of history depicted on film. Over the opening credits, you see the beating of Rodney King as caught on camera, but rarely does the film gain any contemporary edge after that. For all its gross exaggerations and moments of outright ridiculousness, Oliver Stone's JFK felt vital throughout. Malcolm X on the other hand rarely stops seeming like a museum re-enactment of past events; your mileage in this regard may vary. All things considered, this is still a grandiose and mostly well-realized account of a powerful and controversial figure in recent history, very much recommended for people who appreciate such stuff. I got the digibook version of this film from Amazon Italy. Apart from the cover and back leaflet, the content is exactly the same as the US release, including the writing in the digibook. It could not have been easy cramming a 200 min long film onto a single disc (bonus features on a separate DVD) but Warner's transfer is quite strong (especially called for in the early parts of the film where Malcolm wears a LOT of red) and reflects the shooting style of the film. The DTS-HDMA track is subtle but effective. All in all a solid home viewing experience.